Bath Towels 22X44(6Lb) in economy grade optical white can easily be used where there is need of soft towels like premium bath towels. These towels get the job done. Sold in dozens! Gyms, health clubs and athletic facilities are in constant need of durable, comfortable and absorbent bath towels. But they don’t want to break the budget to get the best possible towels on the market. Towel Super Center is the answer! 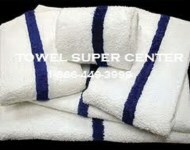 At Towel Super Center, we sell wholesale-priced bath towels in a great 22” x 44” bath towel size. They’re made of 100% cotton, and are offered in units of one dozen. The more units you buy, the lower your price for wholesale bath towels will be. 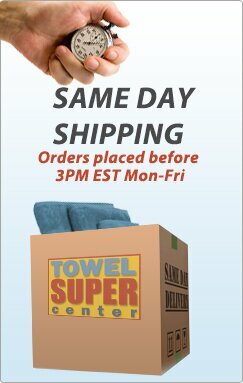 Place your order today and have your economy bath towels delivered right to your fitness facility! When you buy economy bath towels for your gym, athletic facility or health club, you want them to demonstrate the highest quality. You want towels you can buy in bulk for your busy company, which considers towels a priority investment. You need a lot of them, but you also need them to be durable. You want to avoid having to replace the towels after just a few weeks because they don’t hold up in the washing machine or lose all their softness. When you buy wholesale bath towels from Towel Super Center, you can feel confident you will receive a durable and attractive product that will look great days, weeks and months from now. 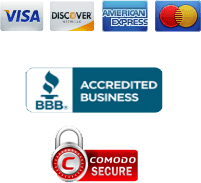 We believe it’s possible to offer such products at low prices, and we stand behind our white bath towels with a return policy that guarantees your satisfaction. Your clients rely on bath towels not just for taking showers, but also for wiping away sweat and staying away from germs and bacteria in the locker room. You want them to feel comfortable helping themselves to lots of towels. That’s why buying in bulk makes sense. You can stock up on everything you need at once, rather than having to place orders over and over. 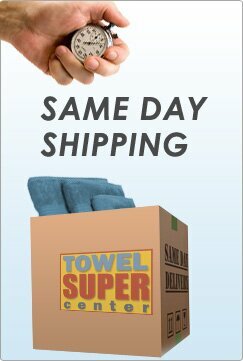 When you buy from Towel Super Center, you get a return policy as well. We want you to love your new towels and feel confident your clients will love them, too. If you’re not happy, you can return them. Are you tired of constantly purchasing new bath towels for your gym members? Do you find that your supply of bath towels dwindles week after week because they fall apart? If so, it’s time to invest in economy cotton bath towels. Cotton dries very quickly. This not only means it takes less energy to dry a bath towel made of 100% cotton, but it also dries quickly after use. Plus, it’s naturally resistant to developing mold, mildew or unpleasant odors. Cotton cleans thoroughly. The fibers of our economy bath towels are woven to optimize the laundering process. You’ll feel good knowing you can get your gym’s wholesale bath towels thoroughly sanitized after every use. Cotton feels great. Many of your health club members may have sensitive skin. Cotton simply feels wonderful against all parts of the body, which makes it ideal for every person at your facility. 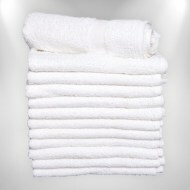 Order your cotton wholesale bath towels in 22” x 44” sizes today!